"DMZ" redirects here. For other uses, see DMZ (disambiguation). The Vietnamese Demilitarized Zone separated North and South Vietnam. A demilitarized zone, DMZ or DZ is an area in which treaties or agreements between nations, military powers or contending groups forbid military installations, activities or personnel. A DMZ often lies along an established frontier or boundary between two or more military powers or alliances. A DMZ may sometimes form a de facto international border, such as the 38th parallel between North and South Korea. Other examples of demilitarized zones are a 120-mile (190 km) wide area between Iraq and Kuwait, Antarctica (preserved for scientific exploration and study) and outer space (space more than 100 miles (160 km) from the earth's surface). Many demilitarized zones are considered neutral territory because neither side is allowed to control it, even for non-combat administration. Some zones remain demilitarized after an agreement has awarded control to a state which (under the DMZ terms) had originally ceded its right to maintain military forces in the disputed territory. It is also possible for powers to agree on the demilitarization of a zone without formally settling their respective territorial claims, enabling the dispute to be resolved by peaceful means such as diplomatic dialogue or an international court. Several demilitarized zones have also unintentionally become wildlife preserves because their land is unsafe for construction or less exposed to human disturbances (including hunting). Examples include the Korean Demilitarized Zone, the Cypriot Demilitarized Zone (The Green Line), & the Former Vietnamese Demilitarized Zone. Aegean Islands – The Greek islands of Chios, Icaria, Lesbos, and Samos are partially demilitarized according to the Treaty of Lausanne. The Treaty forbids all naval fortifications and bases and stipulates that military forces on the islands "be limited to the normal contingent called up for military service." Åland Islands – The Åland Convention of 1921, which was concluded following a decision of the League of Nations in response to the Åland crisis, mandates that the Finnish government maintain the territory as a demilitarized area. Antarctica – The Antarctic Treaty forbids military activity in Antarctica, such as "the establishment of military bases and fortifications, the carrying out of military manoeuvres, as well as the testing of any type of weapon". The Treaty does however provide for the "use of military personnel or equipment for scientific research or for any other peaceful purpose". Ceuta border fence and Melilla border fence – A de facto demilitarized zone exists between the Spanish territories of Ceuta and Melilla and Morocco. Perimeter fences around both cities have been constructed by Spanish and Moroccan authorities, creating a demilitarized zone between the Spanish and Moroccan fences. Dniester Valley Security Zone – Created by the cease-fire agreement ending the War of Transnistria, the Joint Control Commission peacekeeping mission monitors a demilitarized zone roughly outlining the Dnister between Moldova and Transnistria. Ground Safety Zone – A 5 km (3.1 mi)-wide demilitarized area between Serbia and Kosovo was created under the Kumanovo Agreement following the Kosovo War. Idlib - A 15 km (9.3 mi) demilitarized zone, Created by agreement between Russian and Turkish government, splitting the last major stronghold of the Syrian rebels from the Syrian government controlled area. Korean Demilitarized Zone – The Korean Armistice Agreement created a 4 km (2.5 mi)-wide demilitarized zone between North Korea and South Korea following the Korean War. It is currently the most heavily guarded area in the world. Kuwait–Iraq barrier – The United Nations Security Council approved the creation of a demilitarized zone between Iraq and Kuwait in Resolution 689. Although the demilitarized zone is no longer mandated by the Council, it continues to exist. Preah Vihear Temple – The International Court of Justice had ordered the creation of a "provisional demilitarized zone" around the Temple whose ownership is claimed by both Cambodia and Thailand. Sinai Peninsula – The Egypt–Israel Peace Treaty sets a limit to the amount of forces Egypt can place in the Sinai Peninsula. Parts of the peninsula are demilitarized to various degrees, especially within 20–40 kilometres (12–25 miles) of Israel. Israel also agreed to limit its forces within 3 kilometres (1.9 miles) of the Egyptian border. The areas are monitored by the Multinational Force and Observers. Because of the Sinai insurgency all sides agreed and encouraged Egypt to send large amounts of military forces into the area, including tanks and helicopters, to fight Islamist groups. Svalbard – The Svalbard Treaty of 1920, which recognized Norwegian sovereignty over the territory, designated the area as demilitarized. Sudan – A 10 km (6 mi) demilitarized zone along the Sudan – South Sudan border. United Nations Buffer Zone in Cyprus – The United Nations Security Council created a buffer zone separating the self-proclaimed, internationally unrecognized Turkish Republic of Northern Cyprus from the Republic of Cyprus. It was authorized by Resolution 186 and is patrolled by the United Nations Peacekeeping Force in Cyprus. United Nations Disengagement Observer Force Zone – The United Nations Security Council approved the creation of a demilitarized zone in a portion of the Israeli-occupied territory of the Golan Heights in Syria in Resolution 350. The zone is monitored by the United Nations Disengagement Observer Force. United Nations Interim Force in Lebanon - Created by the United Nations with the adoption of Security Council Resolution 425 and 426, to confirm Israeli withdrawal from Lebanon which Israel had invaded in 1978, to restore international peace and security, and help the Government of Lebanon restore its effective authority in the area. Historical map of the promontory of Gibraltar. A neutral territory was established between the British territory of Gibraltar and Spain after the end of the 1727 siege. A strip of land 600 toises (about 1.2 kilometres (0.75 mi)) long, more than two cannon shots' distance between the British and Spanish guns, was called "the neutral ground" and shown as such on older maps. In 1908, the British built a fence in a portion claimed to be the British half of the neutral territory. Spain does not recognize British sovereignty over the isthmus (including the border), asserting it is Spanish soil. Although both the United Kingdom and Spain are part of the European Union, the border is now a de facto international frontier with customs and immigration checks; Spain does not formally recognize it as a "frontier", referring to it as a "fence". Whatever its name, Gibraltar opted out of the European Union Customs Union and is not part of the Schengen Area; the border is open 24 hours a day, with customs duties payable on designated goods entering Spain or Gibraltar. The German Rhineland was made a demilitarized zone after World War I by the 1919 Treaty of Versailles. It was re-occupied and re-militarized in 1936 by Nazi Germany, in violation of international treaties. Following the 1948 Arab–Israeli War, a DMZ (the El Auja Zone) was created by the 1949 Armistice Agreements between Israel and Egypt. The Israeli enclave and Jordanian area on Mt. Scopus was designated as a DMZ. Israel and Syria: Following the 1948 Arab-Israeli War, three DMZs were created by the 1949 Armistice Agreements between Israel and Syria. China: Japanese forces conquered Manchuria between September 1931 and February 1932, when they proclaimed the region the state of Manchukuo. In May 1933, the Tanggu Truce between China and Japan was concluded, establishing a demilitarized zone between Manchukuo and China. In 1945, after the fall of the Japanese empire, Manchuria was re-incorporated into China. 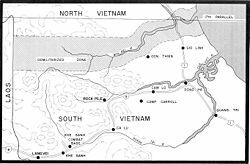 Vietnam: The demilitarized zone between North and South Vietnam was established in April 1954 as a result of the Geneva Conference ending the war between the Viet Minh and the French. The DMZ in Vietnam officially lay at the 17th parallel; in reality, it extended about a mile on either side of the Bến Hải River and west to east from the Lao border to the South China Sea. Norway and Sweden established a demilitarized zone of 1 km on each side of their border after the dissolution of the union between Norway and Sweden in 1905. The zone was abolished by mutual agreement in 1993. El Caguán DMZ was established in southern Colombia between 1999 and 2002, during the failed peace process that involved the Government of President Andrés Pastrana and the Revolutionary Armed Forces of Colombia (FARC). ^ Oren, Michael (3 June 2003). Six Days of War: June 1967 and the Making of the Modern Middle East. Presidio Press. p. 7. ISBN 978-0345461926. ^ Heintz, Jim (17 September 2018). "Turkey, Russia agree on demilitarized zone in Syria's Idlib region". Chicago Tribune. Archived from the original on 8 October 2018. Retrieved 9 October 2018. ^ "Request for Interpretation of the Judgment of 15 June 1962 in the Case concerning the Temple of Preah Vihear (Cambodia v. Thailand)" (PDF). International Court of Justice. 18 July 2011. Archived from the original (PDF) on 17 October 2013. Retrieved 9 October 2018. ^ "Sudan agrees demilitarised zone for north-south border". BBC News. BBC. 31 May 2011. Retrieved 24 October 2015. ^ Ahmed, Amir; Botelho, Greg (9 March 2013). "Sudan, South Sudan agree to pull troops from demilitarized zone". Cable News Network. Turner Broadcasting System, Inc. Retrieved 24 October 2015. ^ "Extracts relating to Article 98 of the Charter of the United Nations: Supplement No 5 (1970–1978)" (PDF). Repertory of Practice of United Nations Organs. United Nations. pp. 275–279. Archived from the original (PDF) on 19 October 2013. Retrieved 6 August 2006. ^ "Palestine Maps" (PDF). Palestinian Academic Society for the Study of International Affairs. Archived from the original (PDF) on 15 February 2006. Retrieved 9 October 2018. This page was last edited on 24 January 2019, at 19:59 (UTC).